While Lord Vishnu was reclining on the thousand hooded serpent Adisesha on the great ocean, a strange idea struck Him. Not one in a million is praying devoutly for His vision but all only for some material benefits. Why not surprise the first human being He accosted by appearing in his presence in the form as He is generally perceived when He is least expected and grant him a boon? The word would spread around and many would start thinking of Him and wishing for His darshan (vision). He then descended on the earth dressed in peetambaram yellow cloth with a crown, the wheel(Chakra), Sangha(conch), Gadha(Mace), Kundala (ear rings) and various gold ornaments studded with precious gems and adorned with garlands of flowers and sacred beads. It was around 8pm already dark in the desolate road of a small city. He chose to wait without getting into the crowded area. The halo around Him gave enough light and visibility for a passerby to see Him. There was a dim lamppost too. It was by a stroke of luck that police constable Manickam had just finished his beat and was proceeding towards his home on this stretch. He could not believe his eyes when he saw the dazzling figure standing a little yonder. He rubbed his eyes to make sure what he saw was real and not an apparition. He hurried his steps swinging his baton vigorously to show his power. Vishnu smiled at him beatifically and said “Hello”. “No, Manickam, I am real God. You are very fortunate to be the first person on whom I set my eyes in earth,” Vishnu answered with a smile that enhanced the beauty of His lotus like lips. “Hey, what guts you have to address me by name? Even the hardened thug speaks to me with back bended and hands covering his mouth. I will put you in the lock up for impersonating God and duping people. Beware,” Manickam spoke in anger. “Do not be foolish and waste your God sent chance. I have come here to give you one single item you want. Do not have any doubt about my identity. I am very much the real God. Don’t you see the halo around me? Ask me what you wish,” Vishnu replied. “Are all the jewelry you are wearing made of gold or in cheap metal as we have in drama theater? Answer me first that point,” Manickam asked eyeing all the time what item would be best for his wife Anjali. He had never purchased even a gram of gold despite the money he made on side most of which goes for his booze. “They are real made of 24 carat gold and the gems are all genuine. Choose what you want but remember only one item,” He said with an impish smile. A though struck Manickam. What if this person is real God and should I be foolish to let go this rare chance? The gold belt on his waist is quite wide and should weigh heavily. He can even melt it and make enough jewels for his wife and daughters. As of now Anjali would look captivating with this gold waist belt even though she was a bit stodgy. “Okay, I trust you. I will take your waist belt for my wife, but If it turns out to be cheap metal, I would not hesitate for a moment to put you in lockup when I see you next. No one dares to cheat Manickam and go scot free,” Manickam said. “Here is it. Take it home carefully hidden lest someone robs you. 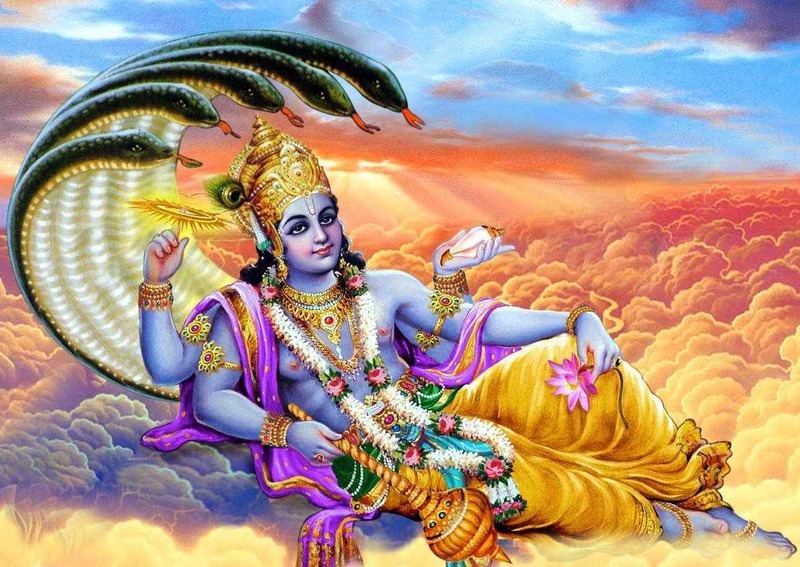 I hope you will remember me henceforth daily, “Vishnu said and disappeared instantly. Manickam felt the waist belt heavy and gloated over his luck as he hurried home. Poor Manickam rubbed his eyes as he got up from the bed aware that he had overslept and that a long day of haranguing awaits him. Delightful story. It also made me think about how I would react in such a situation.... This story has several layers to it! Wonderful and different from the previous one. Simply amazing. Proves that even if God gives, the priest will never give. Hilarious ! Title made me curious to look for the twist but then narration got the better of me. Long time since you posted a hilarious one. Good one- twists are your trademark! Off the beaten track with Gods in the background of this remarkable story had me on tenterhooks and wanting for more tales. Yes, the oddiyanam is an object of desire and the Lord flaunted it well knowing man's avarice!!! I have come to expect suspense from your stories. But this beautiful suspense is unexpected. Other thought came to my mind. Even a police constable does not want to be called by his name. This will happen only in Tamilnadu. Political leaders should not be addressed by their names. Popular movie actors name should be followed by a “Sir”. Whenever I see a TV show where someone calls a movie star so-and-so Sir, I just laugh. This is really hilarious! Had a good laugh! Your narration is too good, Partha Sir! :-) That was a good story ! It can be made into a script for a humorous skit.